Help Friends of the Wissahickon celebrate 95 years of conservation stewardship with a fantastic day of cleanup! 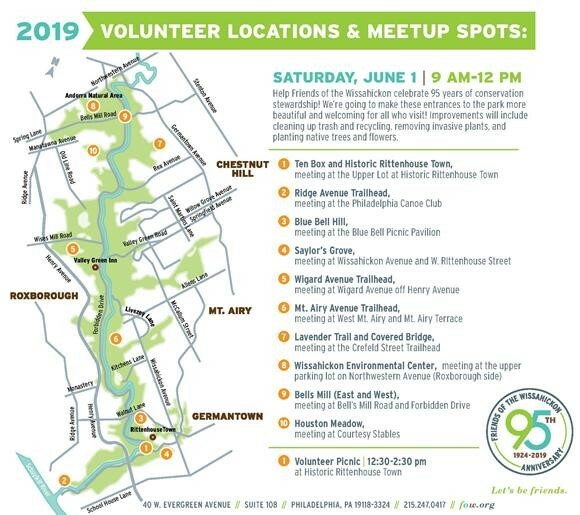 Friends of the Wissahickon will be teaming up with community partners to host volunteer opportunities at 10 different trailheads throughout Wissahickon Valley Park. Together, they are going to make these entrances to the park more beautiful and welcoming for all who visit! Improvements will include cleaning up trash and recycling, removing invasive plants, and planting native trees and flowers. For more information about this event, and to register, please click here!